Devices of the Poseidon series are used for monitoring and alarming in the fully automatic mode. Their features include – monitoring of temperature and humidity, and receiving volt-free signals transmitted by other devices. 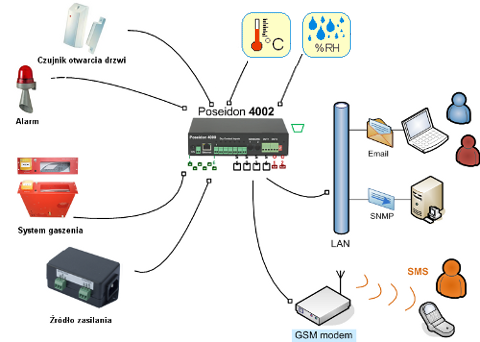 The monitoring device will send a notification by e-mail, sms or SNMP trap into a network operating system whenever the environmental parameters are exceeded. Depending on the version, the devices may be connected from few up to several detectors of temperature, humidity, flooding and volt-free signals receivers.